Is a past relationship still negatively affecting you now? put that relationship in the past and move on with your life. Maybe you broke up with your ex some time ago but they still occupy your thoughts more than you would like. Or maybe it is a more recent break up but you feel ready now, to change your feelings about that past relationship so you can move on faster. You may have persistent uncomfortable feelings such as anxiety, sadness, resentment, guilt, anger and more and feel stuck in a loop of negative emotions. Maybe you feel isolated and alone, as your friends are all in relationships, or your friends were both of your friends and it feels awkward now. Maybe you are in a new relationship but have trust issues with your new partner because of your previous experience. Perhaps you spend too much time agonising how things could have been different – maybe even blaming yourself for it not working out. You’ve stopped doing things you used to enjoy, or you try and suppress your feelings by over eating, drinking, smoking or some other unhealthy habit. You feel frustrated and you are tired of constantly thinking about it, it’s all consuming and you feel stuck, emotional and anxious about the future. Absorbed by those unhelpful feelings for that person and that relationship that are holding you back from moving on and being happy. The good news is you can feel better in as little as one hour from now. so you can move on and be happy. Why should you invest in this programme? As an experienced hypnotherapist and NLP practitioner, I have worked with many lovely people in my clinic in the Cotswolds, who were experiencing uncomfortable after effects of a relationship break-up which were preventing them from being happy and looking forward to the future. I found that a relationship break-up was often the cause of anxiety based issues that people booked in for help with, as well as low self-confidence, unhealthy eating behaviours and more. I have discovered with my unique way of working using NLP, hypnosis and my own interventions, that I could help people move on much more quickly and painlessly than giving it time. So I created this ‘at home’ version which is an easy to follow process that can help you do just the same. The added benefits are that you can do it in the comfort of your own home, work through at your own pace and at a fraction of the price of one-to-sessions. So if you are ready now to put that break-up behind you so that you can feel happier in the present and look forward to the future – this programme is for you. Easy ways to reduce your stress levels, helping you feel calmer and think more clearly. You will learn easy, mind programming techniques to change how you feel about that person and the past relationship so that you can focus on your future and feel positive. You will be able to get rid of emotional baggage that has been weighing you down so you feel lighter, calmer and more at peace. You will feel more in control of your own thoughts and emotions. You will use your own unconscious mind power to file that relationship in the archives of your mind, as over and done with rather than current. You will be able to look forward to what the future holds with a sense of excitement of the unknown. You will grow in confidence and feel more positive. You will learn self-hypnosis to help you with all aspects of your life, now and in the future – to programme yourself for success and happiness. Three e-guide modules sent to you straight away, to work through in your own time – ideally one per week. Each module consists of short, easy, practical tasks that can help you feel calmer, in control and feeling better quickly. This programme also includes two videos clips showing you easy techniques to change how you feel about your ex and feel good about yourself. An easy, step-by-step guide to self hypnosis which you can utilise in all aspects of your life in the future. 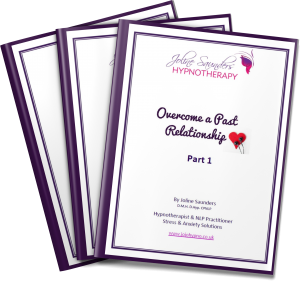 Each module includes a link to a hypnosis MP3 recording to help you install a new way of thinking and feeling about that old relationship and give you a boost of self-esteem and confidence for the future. (You will not receive physical CDs – download links only). These audios are specifically and carefully created to help you overcome those uncomfortable feelings at an unconscious level of mind – so that it happens naturally and automatically. All you need to do is allow yourself 30 minutes to relax, close your eyes, listen and become absorbed by the experience and positive change can happen. Let go of any unnecessary stresses, anxieties and negative emotions that you have been holding onto unconsciously, leaving you feeling calmer, clearer, more confident and ready to move on. Allow your unconscious mind to disconnect fully from any uncomfortable emotions connected to that past relationship, file it in the past in your unconscious mind, so you can use all that energy you had been using stressing about your ex, to help restore yourself. The final steps to moving on from the past, increasing your confidence and creating that exciting future hypnotically so you feel, calm, happy, relaxed and positive. You will have access to our secret Facebook group, where you can find support, tips and advice to help you on this journey of change. By the time you have finished this programme, in just three weeks, you will feel differently about that past relationship and be much happier as a result. Imagine that! Are you ready to get over your ex, move on and be happy? It doesn’t matter if you think you will never get over it, because when you know the secret of the mind programming techniques revealed inside, you will realise that you can and will move on and leave those uncomfortable feelings in the past. A fraction of the price of three one-to-one sessions. so you can begin the process of feeling happier straight away. Once an order is placed the three PDF modules will be delivered to your inbox. Responsibility for all technical uploads / downloads lies with the purchaser. Delivery of this product is strictly for the purchasers sole use only. The company does not accept responsibility for a successful outcome. This product is strictly for those who are not currently suffering from / have suffered mental illness. Do not listen to these MP3 audios when driving or operating dangerous machinery, only listen when it is safe to close your eyes and relax completely.